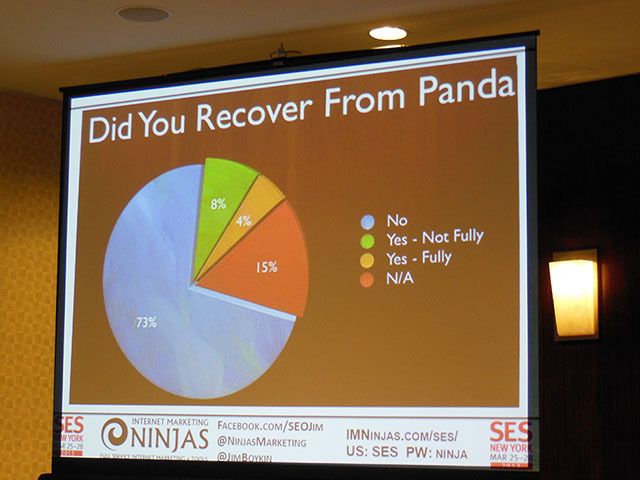 This was a great session by Jim Boykin, the founder of Internet Marketing Ninjas. Jim started off by getting to the point. He said a lot people feel that they did not wrong. People thought that their sites were doing well, they were ranking from a few paid links and they thought they were safe and they were then banned. How do you know if you have been hit by Panda? One clear sign is that traffic to your site has decreased. Some people are just waiting it out, hoping they will soon get their traffic without changing their sites. But you need to act if you want to see your online visibility increase. So what was Panda? The Panda update was mostly about poor quality content. There were many sites who had “thin” content, this means many pages with very little text on the pages. So what are we dong now? Is more content Better? A few years ago, the more content a site had, the better it was. Therefore people were looking to see how much content they could get for as little as possible. Then as we all know, Panda struck and we learnt, that more is not often better. The same came be true for fresh content. Sometimes people are just writing it for the sake of it. If someone runs a search for “blue widgets” in Google, then there are a lot of measurements Google looks for. The best signal you can send to Google is when someone finds “blue widget”, then they see your site and stick to it. They don’t bounce off of it or go and pogo stick. Pogo sticking means someone does a search and then clicks on someone elses result, not yours. How can you make sure you get this traffic? Look at your Google Analytics and see what the words people are using to find your site. Are you serving these users or not? If you are number 2 for plumbers but just do it for NYC, then put on your page say that you are plumbers for NYC. We talked about Panda update, what was Penguin? 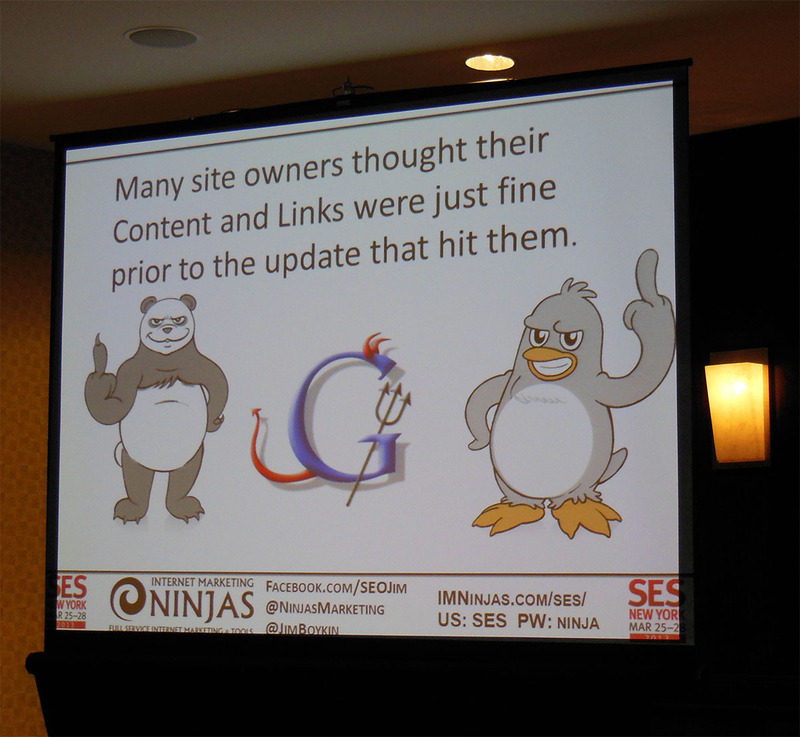 It was mostly about the backlinks a site had to their site. It was as Matt Cutts called it the “over optimistion” ipdate. If you optimise too much, you will get hit. 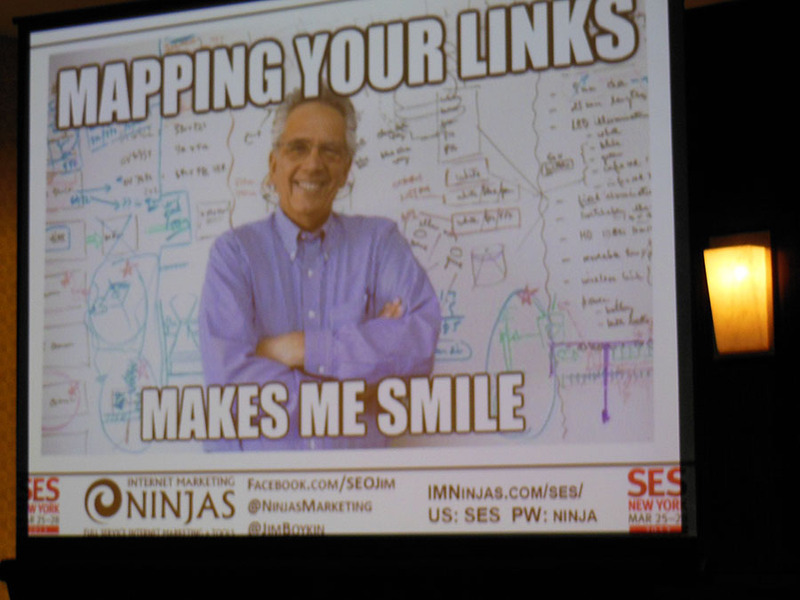 People bought links and then Google said they did not like this type of link building. Jim already suffered at the hands of Google and had to clean up all his backlinks. 65% of sites are hurt by Penguin. Google always say their updates only impact a small percentage of searches. However, you can guarantee if your clients have not been adhering to the Google guidelines, then this update will affect them. Links are still the key but no one has links that are 100% clean. 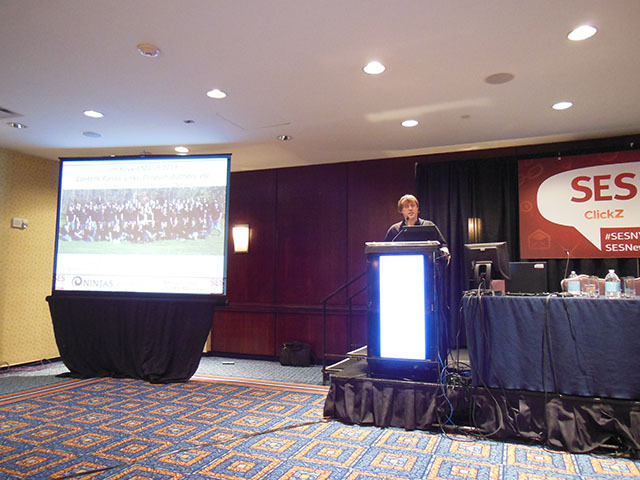 Most of the people affected by Penguin were buying backlinks on scale. Jim strongly told the audience that if you did not get that link warning email, do not do a reconsideration request, but you will need to fix those links. Google are also emailing people that are selling links. One of the biggest things with Pengiun is the exact match anchor text. 65% or more of the same or more anchor text. You need to make sure you have some variations of anchor text. The most common backlink anchor text is all keyword phrases and not branded phrases. This does not look natural which is another warning to Google. “Does your website have thousands of pages, but only a few of those have backlinks to them? It used to be important to have big websites, but now it is better to have small websites and link to the different parts of the site. If you bought low quality blog reviews, you might be in trouble. Pages that link to you, who else do they link out to? Do you know your site links OUT to? – f you link out the worst spammer in the world, then it says a lot about your trust and your site. What is the site about? Do a banklink analysis for Google Webmaster Tools and look at where the links are coming from. If you had a link warning, you will need to remove the links. Putting together a disavow file and submitting it will not help with rankings if you do not remove the links.